Featured Blog #13 What makes this travel blog unique and different from all other travel blogs in the Philippines is its being Nationalistic. Nanardxz, created the blog not only for his love to his beloved home province but also to help his fellow Filipinos to know that South Cotabato is rich with Cultural Heritage, has lots of fantastic tourist attractions to offer and is one of the best place to live in the Philippines. Happy Birthday Nanardxz! Blog description: Everything you need to know about South Cotabato, the latest happenings and events, updates on latest developments and more. 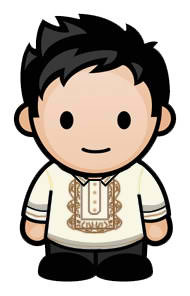 I am Nanardxz, a proud South Cotabateño, a college undergraduate who took up Nursing. I usually go online every 5 hours everyday because I am into online jobs aside from blogging. I love South Cotabato, and that's what I am writing about. What is the inspiration behind his blog and how long has it been around? The lack of positive posts about South Cotabato online way back 2010, our numerous local tourist attractions and the people of South Cotabato, they are my inspirations why I continue blogging. Posting about positive things in the province and getting positive responses from my kababayans motivates me and makes me love what I am doing. Way back 2010, I created South Cotabato Tambayan, a social networking site using the NING platform, it was a hit that many of my fellow South Cotabateños have joined especially from abroad.Most of them were OFW's, they started asking me for updates of what is happening around the province, news, etc., and from then on, I begun posting updates, photos and stuffs. 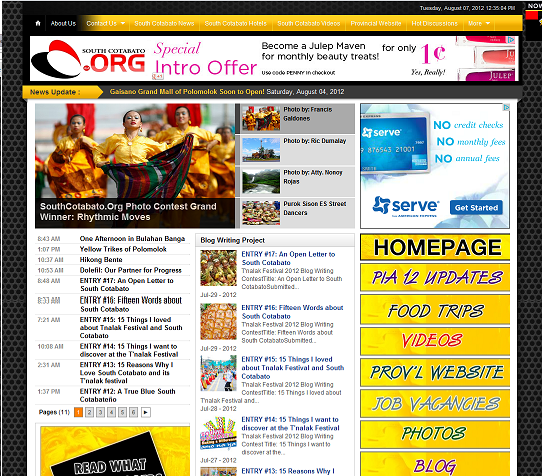 I then created a site on blogspot, South Cotabato News and still using it up to now. I want my fellow South Cotabateños to be informed and to help in the promotion of our beautiful province, there are lots of positive things that still needs to be posted online about South Cotabato. My favorite blog post so far is my list of 10 Things to do in South Cotabato. Through that post I was able once again let the whole world wide web knew that South Cotabato has a lot of things to offer them when they came for a visit. Wow never been to South Cotobato before. I will definitely look into this blog if I ever find my way there. Its good to know that there are people sharing the good things about that part of our country. Thanks for sharing! nice of you to feature bloggers, it's one good way of knowing fellow bloggers more...more power to you mam Tess! I've been to GenSan once but it was a brief stop as part of a Mindanao tour. The site featured is very informative. Will read the blog to find out more about places to see and things to do in South Cotabato. I like SouthCotabato.org because he passionately promotes South Cotabato area as a tourist destination. He deserves to be one of the featured bloggers here. Happy Birthday! South Cotabato is the place where the famous Asik-Asik falls is located. It is located in Alamada, the waterfall is so fresh and the views there are great. South Cotabato needs a voice and by featuring this blog it now has a voice. Great one! promoting one's place is a great advocacy. more power. Nice feature, Ms. Tess. Since I am not really a traveler this site will help me know more about one part of my country. Featuring blogs is a great way to help fellow bloggers in our common goal which is to bring out the information needed by the public, aside from the bloggers' personal views and opinions in a whole range of topics. Good job, Nanardxz. Good way to promote and represent South Cotabato. great network.. hmm this made me thinking hahahah what if i make one too for my place hahaha..
Great resource site if you want to know more about South Cotabato. Thanks for featuring this. Awesome, I really appreciate features like this. It opens doors and possibilities to newcomer in blogging. Interesting sites, it really takes us down south and experienced the happenings even when we are not there. If somebody wants to know more about South Cotabato, this is the site to go. Congrats. Way to go South Cotabato!